A blog by Matthew Ellis, with contributions from friends. Opinions are those of the author. Everything is up for discussion. Nothing is off limits! On the loss of empathy. I must admit I’ve really become discouraged by the tone of the dialogue in our country in recent years. 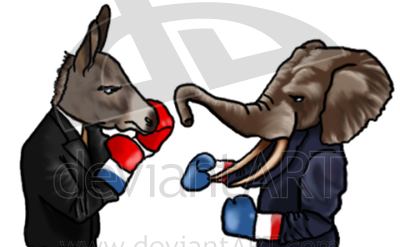 Politics is perhaps the most obvious indicator, but it’s not the only one. Many causes are cited for this decline in our nation’s discourse on all subjects, but I think the anger and distrustful atmosphere in every arena can be boiled down to one thing: the loss of empathy. noun: the ability to understand and share the feelings of another. For many, our communities are increasingly segregated, not just by race, but by income and politics as well. [See this Pew Research study on Political Polarization & Media Habits.] This is destroying our ability to identify with those different from us. The more we isolate ourselves from differing viewpoints, the less we are able to empathize with those in different situations. A lack of contact with people different from us makes us fearful of ‘the other’. It causes us to withdraw, to question motives, to assume the worst and to judge others harshly in order to better protect ourselves. I was speaking with friends who live in Carmel, a suburb of Indianapolis. I was talking about the importance to me of living in a diverse neighborhood with people from all backgrounds. I mentioned that earlier in the afternoon, my wife and I were sitting outside when a car sputtered to a stop in front of our house. The young woman had a child in the car, but simply sat there. I approached her to see what was wrong. She had run out of gas and had called someone to bring her some. I offered her some of the gas we had for our lawnmower. She tried to give me money. She seemed grateful for my gesture, although I felt it took almost nothing for me to help her. I mentioned that this experience reminds me that many people struggle, that many people have difficulty with the things I take for granted. I find this an important way to ground myself and to be reminded of others’ perspectives. Unfortunately, our media has discovered that stoking these fears is the single most reliable way to ensure ratings and so they do it relentlessly. Entire industries have sprung up devoted entirely to achieving political goals through fear and intimidation, facts be damned. These websites, ‘media’ sources, email chains and more are poisoning us. I get so frustrated; not with opposing political views, but with political views and opinions that are simply not based in fact. For instance, I’m already seeing that old nugget about Obama hating Christmas trees popping up in social media, usually accompanied by a comment about ‘the king’ or ‘this is so true!’ The fact that it’s not true is seemingly irrelevant. It confirms the view of that reader, so it must be true. Furthermore, many of the people who try the hardest to pass along this kind of information to others are the least interested in truth. They discount anything that contradicts their worldview as false propaganda, regardless of the source. This is destroying critical thought in our nation. I find that most of the people that buy into propaganda from either the far right or far left are rarely willing to confront evidence their position is factually incorrect. However, I’ll be honest, I’m rarely besieged by my friends on the left with websites equivalent to Townhall.com; I say this because my friends on the right seem far more aggressive in passing along indefensible material and in believing the destruction of America is imminent. You can see one example of this in my recent post revisiting a chain email regarding Officer Darren Wilson’s injuries in Ferguson, MO. I recall another instance claiming that President Obama’s policies were harmful to the lives of poor people. The only problem: the data for the underlying survey was collected in January 2009. Maybe his policies are harmful; however, if you argue that point using false or misrepresented data, your argument is invalid. These are not cases of agreeing to disagree or allowing everyone to have their own opinions. These are examples of arguments based on factually incorrect statements. Combine these falsehoods with hateful, vile rhetoric and an intense belief that the ‘other side’ wants to destroy America and it’s no wonder civil conversations are rare. The shared goal for all of these groups is to destroy empathy in their supporters and to create false narratives for others who might be easily persuaded (particularly those who get their news from a single source or viewpoint). Why is this goal of destroying empathy important for these groups? If we have empathy for another individual or group, it fundamentally changes our response to that person or group. If that happens, EVERYTHING changes and these groups lose their power to affect the conversation. Do you have the strength and curiosity to ask what it might feel like to walk in another person’s shoes? This is a serious question. To truly empathize with another person, we must be willing to attempt to share their perspective in whatever limited way is available to us. To do this honestly and with pure intentions without imposing our judgment is a difficult thing to do. Not many are capable or even willing to try. For instance, let’s look at the events in Ferguson, MO and consider some questions. How might it feel to be a person of color and see report after report of unarmed men, women and children shot and killed by the very people sworn to protect them? Would that inspire confidence? Rage? Fear? How would centuries of slavery, racism, prejudice, and oppression impact these feelings? Would you be willing to trust the institutions that had propagated these systems of oppression for so long? Would you be willing to trust the individuals who had pledged to distribute justice fairly but failed repeatedly? How might it feel to be white and observing these events? What would your emotions be? Who would you identify with in the situation? How would it feel to be a police officer caught up in the chaos of these emotions? How would you control your own emotions? Would you fear for your own life or the lives of your fellow officers? How would you maintain control in this environment? Would that be difficult? What if you agreed with the protesters? What if you disagreed? How do your answers change if you imagine asking these questions from the perspective of a person of a different race? How would you view those protesting these actions? Would you understand the underlying emotions? How would you express your own thoughts about the situation, regardless of whether you agreed or not? How would you feel about these protests? What if you agreed with the protesters? What if you disagreed? How would that make a difference in your response? The answers are not important here. The critical aspect of this process is merely to ask questions that lead you to consider a different point of view and to seriously entertain all of the possible answers from those perspectives. By engaging with these questions and being curious enough to imagine the possibilities of how someone might feel in these situations, we broaden our perspective. In the Episcopal Church, our Baptismal Covenant calls us to “respect the dignity of every human being.” Asking these questions and trying to see events from another’s perspective is one of the most fundamental ways we can do this. So how can we build up empathy for others? I think it’s fairly simple in terms of a plan but I think the plan is actually difficult to execute. Step 1: Place a strict filter on your media sources. Garbage in, garbage out. Anything that is routinely expressed in hyper-partisan or extremely negative terms should be removed from your regular reading. Any source that regularly promotes material not based in actual fact (check them from time to time) should be disregarded. Ask yourself what the lives of others might be like. Try often to imagine other perspectives. Read books from authors and genres you are unfamiliar with, especially those with a strong narrative voice. Find someone you disagree with and then try to convince yourself of their position. Read differing respected (and respectful) opinions on the same subject. Step 3. Engage with others different from you. Place yourself in positions where you interact with people you normally would not. Seek out a conversation with someone you don’t know and who seems to have a different background than you. Learn about their life experiences and how that impacts their thoughts and behavior now. Try to put yourself in their shoes. I’m convinced that if we find a way to empathize with each other, to respect the dignity of every human being, we will find solutions to our problems fairly quickly. As I mentioned above, this is far easier said than done. For too long, we have allowed politicians to set the tone and we have followed their lead. This has led to divisive, hateful rhetoric where the dignity of those who disagree with us is not respected, in any sense of the word. We can change that for ourselves and each other. Try feeling empathy for those around you and different from you. It might make all the difference in the world. Our good friend and neighbor who sent this is a retired homicide detective with the Philadelphia Police Dept. Here’s what that poor little child did to that mean old policeman……Why isn’t the media releasing the photos of Police Officer Darren Wilson’s injuries after he was assaulted by “the unarmed black teenager”? I don’t know how severe Officer Wilson’s injuries were, but CNN has reported that the claims of a broken eye socket were false. 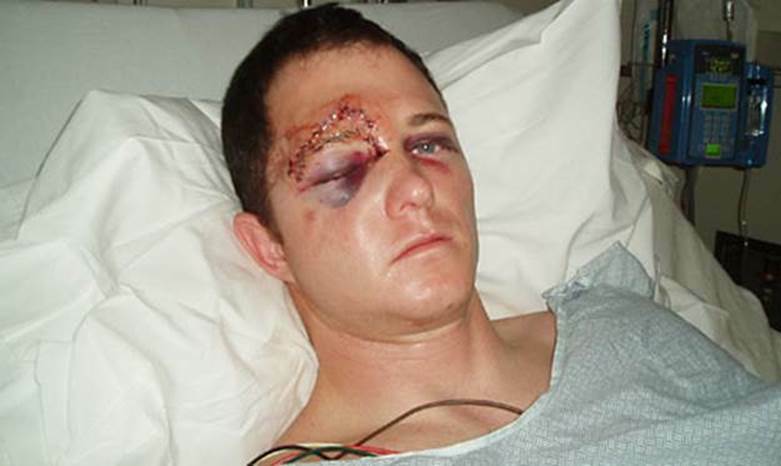 In addition, this photo is of a guy in a motorcycle wreck who landed on his face, so I don’t think we can say this is what Officer Wilson’s injuries look like. It’s certainly not Officer Wilson in the photo, despite the misleading claim otherwise. This isn’t a comment on anything in the situation, just saying it’s important to not form opinions based on misinformation. Now, I’m not saying these injuries aren’t severe; maybe you think they are. However, they surely don’t look anything like the pictures in the email I received over and over. If you would like to learn more about Officer Wilson’s testimony to the grand jury, you can read a summary here. In general, if you ever receive an email that is a forward from someone that didn’t personally write the email being sent, assume that everything in it is false; it usually is. Certainly don’t pass it along to others just because the sentiment sounds good or seems like it’s probably ok. The people who craft these lies do so in the hopes that you will read it, internalize it, and use it as the basis for your future opinions even if you later find out it’s false. Don’t let them manipulate you in that way. Bring on the Driver-less Cars. Now.